I found the part of the joystick that hit the L trigger so I used my dremmel and took some of the skirting off. I took a little much but I was in a rush as you can see from the pictures. You saved guys at Retro Fighters a lot of time! They are looking for the best solution to fix that problem, and I was a bit worried I must say. Now they can just send replacement caps to everyone. Looks like a easy enough install. What kind of caps can be fitted on to that stick? 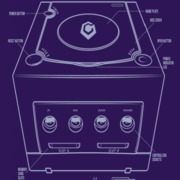 Are GameCube ones compatible? That would be rad. They also have that cutout by default for some reason, maybe same one? Just not sure if that's the same place if it fits onto. If you wish to add me to the Multitap, PM me please. No the caps can not change. But I have found a better way to fix the issue just no way to contact them. They just have to slightly change the L trigger. It's about 3 mm longer then the shell of the controller and has a hook/ stopper. If they took the hook part off, shortened the trigger just a tad and added a bit of plastic protruding in the middle of the L trigger 'inside the controller shell' the hook would no longer be needed and it would have all the clearance it needed. Oh I also forgot to mention. The caps are not easily removed 'Think cheap ps3 controller', a noob would most likely damage the controller in the process of getting that sucker off.